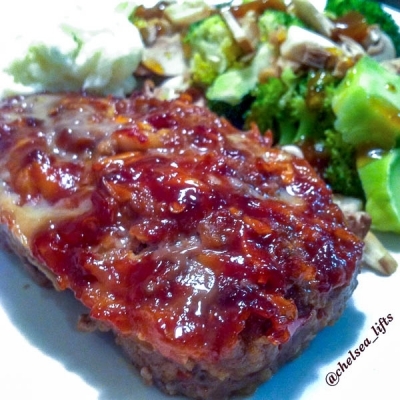 A sirloin based meatloaf so it is a higher quality of meat with more protein and less fat. Another great aspect of this dish is my signature BBQ sauce that I make from scratch and heavily spread on top of the loaf for added flavor and juiciness! Mix ground sirloin with egg, 1/4 cup diced onion, garlic powder, chili powder, Panko breadcrumbs, and 1tsp of minced garlic in a big bowl. Knead ingredients together with hands only until mixed, do not over churn meat! Spray 3 mini-bread loaf pans with non-stick spray and equally distribute meat into pans. Set aside and begin to make BBQ sauce. For sauce combine the following ingredients in a small saucepan over low-medium heat: ketchup, Worcestershire sauce, honey, the rest of your diced onion, apple cider vinegar, and ONE chipotle from the can of chipotles in adobe sauce. Let simmer while stirring frequently until ingredients are cooked down and combined. Taste test and add spices/additional ingredients as needed. Once sauce is ready coat each meatloaf generously with the sauce. Put loaves in preheated oven for about 30 minutes or until cooked throughout. Any extra sauce can be used to baste with or add on top of cooked meat loafs.